I use an older version of WSFTP (8.0). I wanted to backup the .ini file that holds all the site configurations. I was unable to locate it, but eventually search enough and found it. Here is the path I needed to get the file. I have another client’s site attacked by Sejeal. Again I found a “sejeal.JPG” file in the root directory. Client called me saying the hyperlinks don’t work. Browser was giving back 404 error. I found this article that shed some light on the matter. One of my main tools “JCEditor” has a vulnerability that attackers are exploiting. 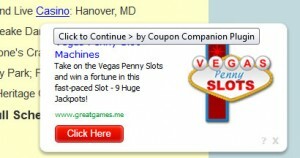 Coupon Companion Plugin – adware / malware removal. I recently installed a audio driver to fix a problem with the “what you hear” input device. Shortly after that when browsing hyperlinks would throw pop-up window linking to an ad for something. Here is an example. At the bottom of the window was “Coupon Companion Plugin” banner. With some research I found this is adware. I followed the steps to remove the adware. Hoping this works. I doing this I also discovered my machine also had “InfoAtoms” on it . More adware. I followed the following article to remove this as well. It seems we can expect more of this in the future. Stay safe my friends.